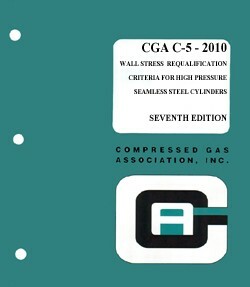 This publication contains detailed methods of determining average wall thickness that can be applied to the retesting of seamless, high pressure cylinders conforming to Specifications ICC 3, ICC/DOT-3A, DOT-3AX, DOT-3AA, DOT-3AAX, and DOT-3T, as well as the equivalent Canadian specifications. The flow chart contained in Appendix A graphically illustrates the service life control procedures described in this publication. The procedures required to qualify cylinders for special filling limits in accordance with DOT and TC regulations are provided in Appendices B and C, respectively. The suggestions contained in this publication do not apply to cylinders manufactured under specification DOT-3HT, CTC-3HT, or TC-3HTM. Because of the special provisions of this specification, separate recommendations covering service life and standards for visual inspection of these cylinders are contained in CGA C 8, Standard for Requalification of DOT-3HT, CTC-3HT, and TC-3HTM Seamless Steel Cylinders.